Hey there! Today I’m back with Painted Tile Coasters – a fun craft that makes a great hostess gift or just a fun set of coasters for your own coffee table! These are so simple to make, you could easily have your kids help or have them make them themselves. Tape off a section. I kept my design geometric, think stripes and diagonals. Paint the untaped section. Let it dry. Paint as many coats as you need until you achieve the desired coverage. I needed about 3 coats. I painted this section a color called “night sky” on all the tiles. The taped off section was then painted a contrasting color. Once this is dry, remove tape and paint a contrasting color. 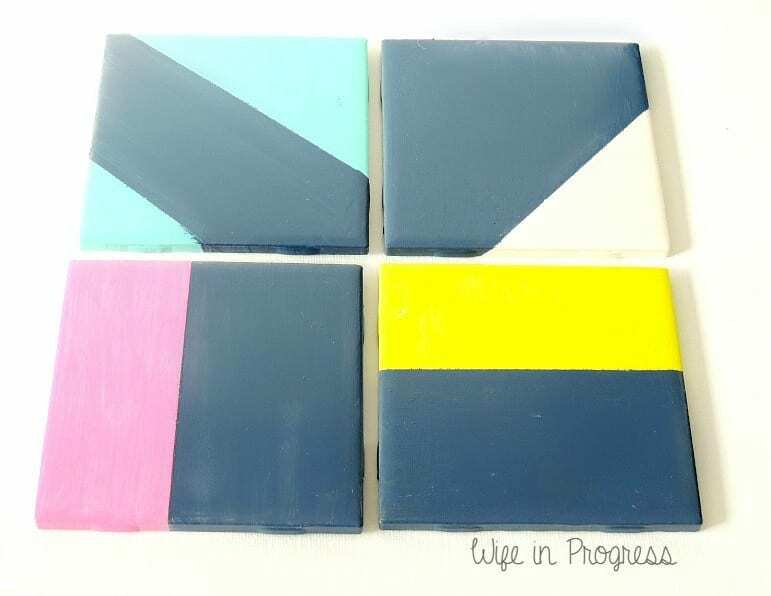 I love bright colors against navy so I chose a chartreuse, hot pink, turquoise and chose to leave one tile white. The chartreuse apparently photographs bright yellow but it’s really a great green shade and the pink is much more vibrant and neon than pictured, too. Add some felt to the bottom or some felt pads to the bottom corners so that the coasters don’t scratch whatever surface they are placed on. 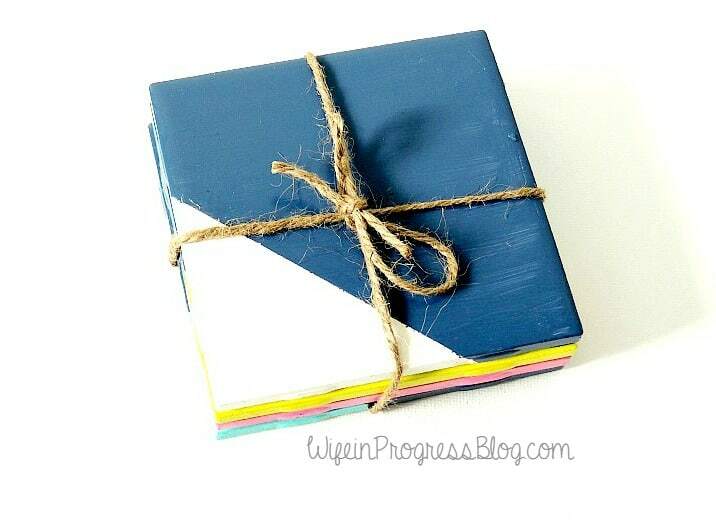 If you’re presenting as a gift just stack ’em up and wrap some twine around them. How cute! Love this for a little hostess gift! Stopping by from the party at Work It Wednesday!